Abissinorum sive Pretiosi Ioannis Imperiu - MERCATOR, G.
Title : Abissinorum sive Pretiosi Ioannis Imperiu. Size : 13.5 x 19.3 inches. / 34.3 x 49.0 cm. 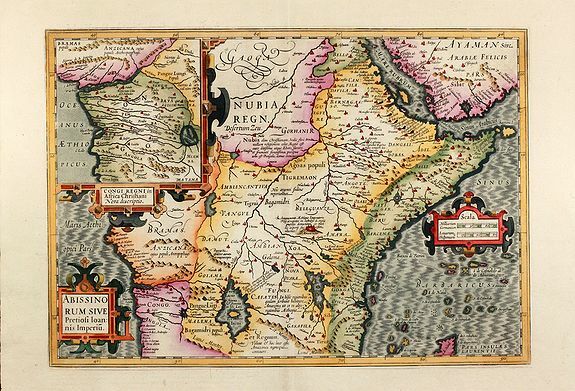 Description :Hand coloured map of Central Africa by G. Mercator. With two beautiful coloured cartouche and one inset map of the Congo. Showing the Kingdom of Prester John in central Africa, how was a mythical Christian king. From the 1638 edition of the Mercator-Hondius Atlas, Latin text on verso. Condition : Centrefold back with thin Japan paper, very good condition in attractive colours.